We report the case of a 5-year-old male child presenting with seizures for 4 months. Magnetic resonance imaging (MRI) revealed a cortical-based solid cystic lesion in the right parietal lobe. Histopathological examination showed a tumour comprised of spindled glial fibrillary acid protein (GFAP) positive neoplastic cells interspersed with bizarre pleomorphic cells showing nuclear pseudoinclusions and intermingled dysplastic ganglion cells variably immunopositive for synaptophysin, chromogranin, Neu-N and immunonegative for neuron filament protein (NFP). 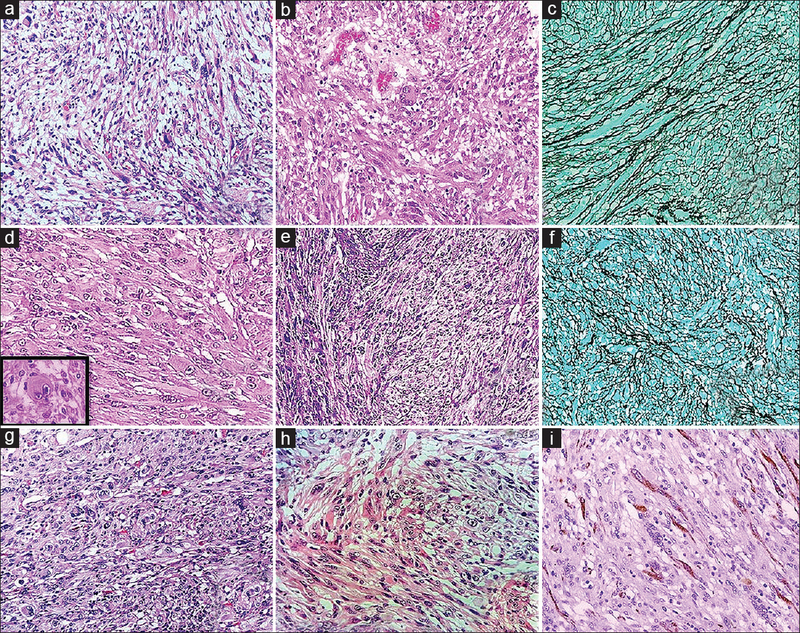 This report highlights the occurrence of the rare composite pleomorphic xanthoastrocytoma-ganglioglioma and the vagaries of immunohistochemical analysis in highlighting neuronal differentiation in such a case setting. In addition, to the best of our knowledge this is the youngest patient till date to present with this entity. Pleomorphic xanthoastrocytoma (PXA), a low-grade glial tumour affecting the superficial cortex and leptomeninges was first described by Kepes et al. in 1979. Its cytological pleomorphism may pose a grave diagnostic challenge vis-a-vis the biologically aggressive glioblastoma. Histogenetically, PXA shares a possible relationship with neuronal tumours like ganglioglioma (GG) and desmoplastic infantile glioma (DIG). Few reports have described the association of PXA with glioneuronal tumours, maldevelopment and cortical dysplasia., The present report highlights the association of PXA with GG and delineates the caveats of routine immunohistochemical markers for neuronal cells in assessing such cases. To the best of our knowledge this is the first report from India. In addition, this patient is the youngest to have been diagnosed with PXA-GG till date. A 5-year-old boy presented with intermittent episodes of seizures since 4 months. There was no history of trauma, loss of consciousness, bleeding or vomiting. Past history and developmental history were unremarkable. The patient was conscious, well oriented and showed no sensory or neurological deficits. Laboratory investigations revealed reduced haemoglobin (10.5 g/dl). Other biochemical and haematological parameters were unremarkable. Contrast enhanced computed tomography (CECT) showed a peripheral well-defined superficial lesion measuring 46 × 44 × 43 mm in the right parietal lobe with perilesional oedema, multilocular cystic component and an intensely enhancing mural nodule measuring 26 × 17 mm attached to the lateral wall. The lesion produced a mass effect effacing the right lateral ventricle. 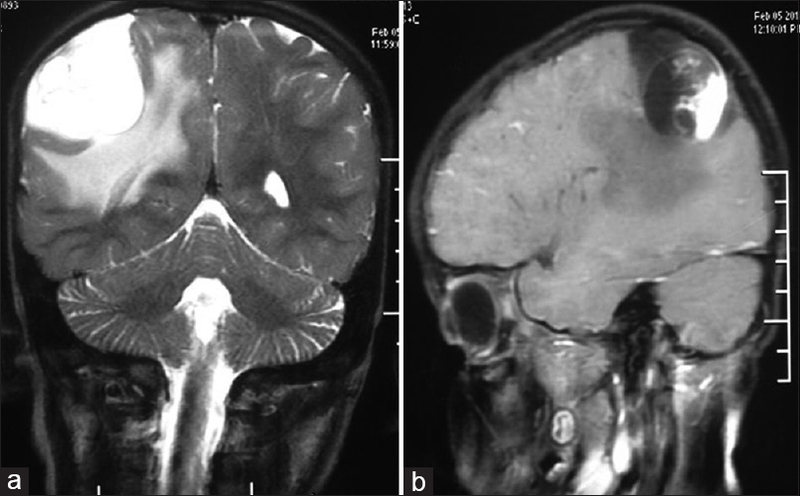 Magnetic resonance imaging (MRI) showed a well-defined cortical-based solid cystic lesion in the right parietal lobe with perilesional oedema, hyperintensity on T2-weighted images and post-contrast enhancement [Figure 1]a and [Figure 1]b. Craniotomy with tumour decompression was performed. Histopathological examination revealed a tumour invading the leptomeninges and rarely the surrounding cortex. The tumour showed areas of varied morphology, showing short fascicles of spindle cells having moderate eosinophilic cytoplasm, ovoid nuclei and scattered pleomorphic giant cells [Figure 2]a and [Figure 2]b. Reticulin stain showed fibrils surrounding both individual tumour cells and small groups in the PXA component [Figure 2]c. Intermingled were nests and scattered dysplastic ganglion-like cells with irregular nuclei [Figure 2]d, [Figure 2]e, [Figure 2]g and [Figure 2]h, reticulin surrounding the small nests [Figure 2]f. Foci of microcystic change and perivascular lymphocytic cuffing were seen throughout. There was no necrosis, endothelial vascular proliferation or significant mitotic activity. Ki-67 index was 3% in the PXA component and 1% in the GG areas. Eosinophilic granular bodies were scattered in both areas. Tumour cells were strongly positive for vimentin, S-100, glial fibrillary acid protein (GFAP) immunopositivity confined to the spindle cells [Figure 2]i. The dysplastic ganglion-like cells were positive for synaptophysin (SYN) (Thermoscientific, Monoclonal, SP11, Ready to use) [Figure 3]a but were negative for polyclonal SYN (Neomarkers, CA, 1:100). Dysplastic ganglionic cells were positive for chromogranin-A, focally for Neu-N [Figure 3]b and negative for neurofilament protein (NFP). MAP2 stain diffusely decorated the ganglionic component [Figure 3]c, however was focally positive in the astrocytic component also. CD34 was diffusely and intensely positive in the PXA component. GG nests were characterized by a reduced stain density with the immunostain decorating cellular outlines [Figure 3]d,[Figure 3]e,[Figure 3]f Isocitrate dehydrogenase1 (IDH1) and epithelial membrane antigen (EMA) were negative throughout. The patient is currently doing well and is on a regular follow up since the last 1 year. PXA-GG, a composite glioneuronal tumour was first described by Furuta et al. in 1992. PXA-GG may show three histological patterns – one in which the distinct glial and neuronal components 'collide' with each other, second in which dysplastic ganglion cells 'blend' with the PXA as seen herein and the third in which SYN and/or NFP immunopositive elements are interspersed throughout a classical PXA. In the present case, lipidized astrocytes characteristic of PXA were sparse and GFAP positivity was confined to the spindled elements of the tumour. Scarcity of foamy xanthic cells was also noted by Furuta et al. in their description of composite PXA-GG. However, the dense reticulin pattern, bizarre pleomorphic giant cells, immunopositivity for vimentin and S100 favoured a PXA component. SYN positivity was seen in the ganglionic cells but results varied with the clone used. Though neuronal differentiation was convincingly seen on the H and E stain, the variable SYN, negative NFP and diffuse positivity of primitive marker CD34 led to diagnostic dilemma. A recent study suggested that CD34+ cells may represent primitive neural precursors. SYN staining alone should be viewed with caution as perikaryal staining may be seen in normal cortical neurons in the infiltrating area of gliomas in disturbed neocortical tissue and even in normal human brain. Distinct MAP2, Neu-N and chromogranin-A positivity in the dysplastic ganglionic cells strengthened the case of a neuronal component. Another differential considered was the DIG. This generally occurs in children <18 months of age, afflicts multiple lobes, shows small primitive neural cells with dense desmoplasia histologically and hypointensity on T2-weighted images. These features were not seen in this case. Apart from the diagnostic dilemma and pitfalls discussed above, this case assumes importance as to the best of our knowledge, this is the youngest presentation of PXA-GG. A limitation of this work was the absence of ultrastructural analysis which though desirable could not be performed on the tissue which was formalin fixed. BRAF mutation analysis may also be studied in future cases as a useful adjunct. PXA-GG may follow a low-grade biological behaviour like its constituents but retains the potential for malignant transformation. The patient is on a regular follow up and is currently asymptomatic. Studies on larger cohorts of PXA and GG cases would further elucidate the histogenesis and biological behaviour of this entity. Whether astrocytic PXA undergoes transitional changes like loss of lipidization and acquisition of primitive neuronal elements while progressing towards the neuronal GG requires further molecular and ultrastructural research to understand whether the tumour histogenesis is due to multidirectional differentiation from a primitive progenitor or dedifferentiation. It is suggested that a panel of neuronal markers must be employed to safeguard against variability in clones and antigen retrieval methods. Kepes JJ, Rubinstein LJ, Eng LF. Pleomorphic xanthoastrocytoma: A distinctive meningocerebral glioma of young subjects with relatively favorable prognosis. A study of 12 cases. Cancer 1979;44:1839-52. Powell SZ, Yachnis AT, Rorke LB, Rojiani AM, Eskin TA. Divergent differentiation in pleomorphic xanthoastrocytoma. Evidence for a neuronal element and possible relationship to ganglion cell tumors. Am J Surg Pathol 1996;20:80-5. Furuta A, Takahashi H, Ikuta F, Onda K, Takeda N, Tanaka R. Temporal lobe tumor demonstrating ganglioglioma and pleomorphic xanthoastrocytoma components. Case report. J Neurosurg 1992;77:143-7. Lach B, Duggal N, DaSilva VF, Benoit BG. Association of pleomorphic xanthoastrocytoma with cortical dysplasia and neuronal tumors. A report of three cases. Cancer 1996;78:2551-63. Perry A, Giannini C, Scheithauer BW, Rojiani AM, Yachnis AT, Seo IS, et al. Composite pleomorphic xanthoastrocytoma and ganglioglioma: Report of four cases and review of the literature. Am J Surg Pathol 1997;21:763-71. Sugita Y, Irie K, Ohshima K, Hitotsumatsu T, Sato O, Arimura K. Pleomorphic xanthoastrocytoma as a component of a temporal lobe cystic ganglioglioma: A case report. Brain Tumor Pathology 2009;26:31-6. Kordek R, Biernat W, Sapieja W, Alwasiak J, Liberski PP. 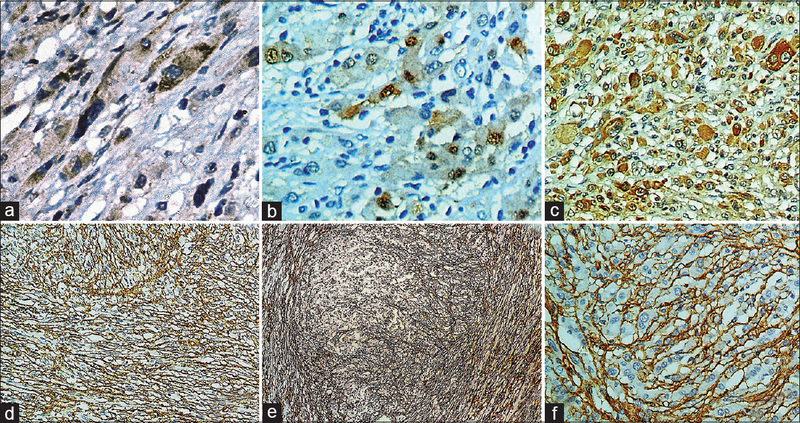 Pleomorphic xanthoastrocytoma with a gangliomatous component: An immunohistochemical and ultrastructural study. Acta Neuropathol 1995;89:194-7. Deb P, Sharma MC, Tripathi M, Sarat Chandra P, Gupta A, Sarkar C. Expression of CD34 as a novel marker for glioneuronal lesions associated with chronic intractable epilepsy. Neuropathol Appl Neurobiol 2006;32:461-8. Quinn B. Synaptophysin staining in normal brain: Importance for diagnosis of ganglioglioma. Am J Surg Pathol 1998;22:550-6. Tamburrini G, Colosimo C Jr, Giangaspero F, Riccardi R, Di Rocco C. Desmoplastic infantile ganglioglioma. Childs Nerv Syst 2003;19:292-7.